Since the inception of the Walt Disney Company, it’s not just the iconic images, stories, and characters that have left an indelible mark on the American psyche. The multimedia conglomerate has shaped American life in other ways, many of them derived and informed by the decidedly fascist, anti-Semitic, anti-labor union, conservative and religious perspective of Walt Disney himself. The rumors that Walt Disney was a Nazi abound in the age of the internet, and though labeling him a National Socialist without physical proof is a bit of a stretch, there were certainly characteristics of Nazism in Disney’s politics, professional behavior, and views of social conservatism. At best, Disney could be seen as a Nazi-sympathizer. Famed Disney animator Art Babbitt, who worked closely with Disney, once claimed—as quoted in Peter Fotis Kapnistos’ book Hitler’s Doubles—that “[i]n the immediate years before we entered the War [World War II] there was a small, but fiercely loyal, I suppose legal, following of the Nazi party…There were open meetings, anybody could attend and I wanted to see what was going on myself. On more than one I occasion I observed Walt Disney and Gunther Lessing [Disney’s lawyer] there, along with a lot of prominent Nazi-afflicted Hollywood personalities. Disney was going to these meetings all the time.” They were none other than the meetings of the German American Bund, or the American Nazi Party. Disney also personally hosted Nazi filmmaker Leni Riefenstahl when she came to promote her film Olympia in 1938, a month after the infamous assault on Jews known as Kristallnacht. Disney gave the propagandist a grand tour of his studio, and Riefenstahl even commented that it was “gratifying to learn how thoroughly proper Americans distance themselves from the smear campaigns of the Jews.” This is documented in the Steve Bach biography about the filmmaker titled Leni. Though difficult to defend, the meeting with a prominent Nazi figure could be explained through their shared craft and business interests: both were filmmakers enlisted at different times with the task of crafting propaganda as media limbs of the American and German governments respectively. A possible explanation for this meeting is that Disney wanted to get his films back into Germany after Hitler banned all American movies because Hollywood was “controlled by the Jews.” However, Disney was even criticized back then for receiving Riefenstahl shortly after the brutal Night of Broken Glass, which is, in any way you look at it, inexcusable. In contrast to his reception of Riefenstahl and his meetings with the American Nazis, Disney was tasked with making anti-German propaganda films when the war started. In Education for Death: The Making of a Nazi (1943), Disney animators describe the birth of an Aryan German before cataloging the indoctrination process of the Hitler Youth in a ten-minute quasi-documentary propaganda piece. Unlike the depiction of the wolf in Disney classic Three Little Pigs posing as an ostensibly Jewish swindler—another possible example of Disney anti-Semitism—Der Fuehrer’s Face (Donald Duck in Naziland, 1943) fails to describe the systemic anti-Semitism of Nazi propaganda beyond mentioning the concept of a master race. The anti-German propaganda films Disney made for the American government don’t go far enough in criticizing the Nazis, but that isn’t the point. Disney the man didn’t need to be a full-fledged Nazi to lean to the far-right in the Age of Fascism. 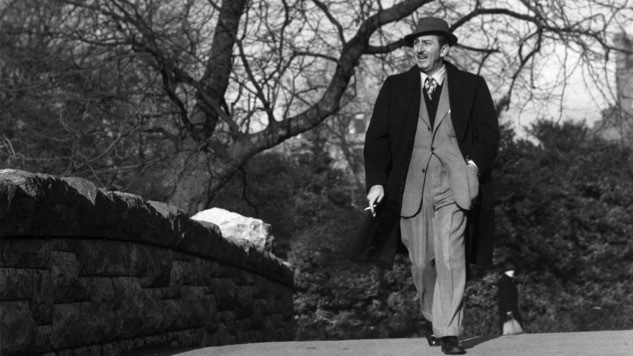 Not only was Walt Disney a committed social conservative and God-fearing American patriot, he was a staunch capitalist whose political philosophy paradoxically embodied many of the criticisms found in the fascist worker ideology satirized in Education for Death. The fact that Disney was enlisted to make these anti-German propaganda films is not surprising, and neither was his willingness to do so. However, it does not negate the allegations of anti-Semitism or of other fascist behavior. In fact, when Disney began working on the Disney World tourists flock to today in Florida, he was engaged in a utopian concept of fascism he called the Experimental Prototype Community of Tomorrow (EPCOT). It was to be a place where unions would be prohibited, democracy non-existent, and social security merely a laughable notion. The concept is now gaining tangible influence in privately gated communities guarded by their own security forces. This demand for loyal labor is disturbingly similar to the governments of Mussolini’s Italy and Nazi Germany. Fascist states of the 1930s and 40s utilized this communal approach to nationalizing land, resources, and labor to benefit the nation-state as well as the despots who controlled them rather than the citizens. Or they would benefit certain citizens over others. These practices created anti-democratic police states and societies in which the people were expected to labor diligently and give back to the state institution. Instead of using National Socialism, Disney wanted to utilize his prominent and unregulated role in bloated American capitalism to gain more power over land and people. Disney wouldn’t usurp power in a state, he would create his own private entity using the labor of the workers—writing his own laws and enforcing them with his proto-police security force, making EPCOT a microcosmic society in America with sovereignty unchallenged by the local or federal governments. Even today this legacy lives on. To make it all possible, the Disney Corporation lobbied for the creation of the Reedy Creek Improvement District in the 1960s, which gave the company broad authority over what we know as the area surrounding Disney World. Since then, the corporation has maintained near total control of the land and does with it what it sees fit. Namely, building new attractions and making superfluous amounts of cash. The result of Disney lobbying was the city known as Lake Buena Vista, Florida with a population of around 40 citizens who are all employed by the Disney parks that serve 30,000,000 visitors a year. The employees live there, are un-unionized, face strict standards and requirements, are paid low wages, and face eviction if they were to leave their job. Meanwhile, corporate sponsors are littered throughout the theme parks, which surely make Disney enough money to treat and compensate these customer-beaten and underpaid workers better. The attraction hosts, who bear the brunt of the emotional abuse from customers, get paid a modest $9.22 an hour. But paying lower level employees higher wages would obstruct the profits made by the Nation of Disney from its loyal legion of obsessive admirers. And these tactics have been fruitful for Disney, with urban developments and commercial centers using the model as a blueprint that truly and unequivocally affects the lives of workers and consumers alike. Like the fascist states of the 1930s, Disney dictates how their employees look—jewelry, long fingernails, and long hair for men are prohibited—and establishes the emotions that must be worn on their faces at all times. Emotional labor, as it has come to be known, has proliferated across American culture when we began demanding interminable smiles and cheer from service employees. If you’re wondering where this idea that creating a facade of happiness boosts profits, look no further than Disney. If going through unfair circumstances solely for the benefit of a corporate entity that has broad authority like a state and freedom like a corporation isn’t fascism, I don’t know what is. The fascist tendencies in the questionable treatment of workers seeps out of the parks themselves. Both Disneyland and Disney World are infamous for their secrecy, making it difficult for the outsider to know how staff is treated outside of the reportedly strict rules and requirements. The former mayor was also the computer-operations supervisor in the corporate offices of the company, which suggests that the lines between public and private personnel in Lake Buena Vista are commonly blurred. Though the company denies any conflicts of interest, the evidence of possible corruption doesn’t lend itself very well to oversight of the company or their workforce that is not protected yet communally driven by an affinity for the company, a phenomenon similar to nationalism. In addition to the problems with the parks’ employment, Disney portrays a pervasive willingness in its content, and therefore its parks, to promote the status-quo of elite dominance and subtle affinity for centralized power. It is found, among other things, in the promotion of monarchy. Some examples of class disparities are the princesses Snow White and Sleeping Beauty, the animal kingdom of The Lion King, and the pursuit of elitism in Cinderella just to name a few. In addition to elitism and monarchy, the first Jungle Book movie has been criticized as racist for stereotyping black and indigenous people while promoting racial segregation, and Pinocchio can be interpreted as a quest for racial purity. While many might say this is far-reaching, inequality in both class and race are more tangible consequences of the success of exploitative tendencies influenced by Walt Disney and are directly at odds with human rights and fair labor treatment. Not only did Walt Disney seek political insulation to circumvent labor regulations and competition that threatened the landscape dominated by his pseudo-security state, Disney said he did so in an attempt to create whole new worlds at his theme parks. To achieve the political and social isolation the parks enjoy today, the Disney Corporation began a vast campaign of lobbying to get around regulation and taxes while using multiple companies to galvanize thousands of acres of land for the production of Disney World. It was to be secluded by a physical moat and accessed by Walt’s pipe dream of an airport within the microcosm. Though public money was not used to establish resources or build the tangible worlds created by Disney, it does not mean the company should have been able to get around the law. Better yet, they should not have had the ability to write the laws. Now that the Disney Corporation has become the second largest media conglomerate on the planet, their attempts to influence politics in their favor have not mitigated. According to the Center for Responsive Politics, the conglomerate spent around $4 million on lobbying contributions to political action committees, political parties, and individual candidates in 2016, while 17 out of their 22 lobbyists from the year 2015-2016 previously held government jobs. Walt Disney is heralded as a utopian, but his personal record and the influence on the Disney Corporation’s tactics paint a picture that is much grimmer than the sunshine, cuddly animals, and quirky characters that are as sewn into the American fabric as hamburgers and apple pie. Simply put, the reality that one person’s utopia is another’s dystopia is simply a part of the American story. While the consumer culture of Disney emanates out of its fabricated worlds, the inequitable influence of both the company and the man’s fascist history drips into American culture and politics, indirectly affecting our lives while remaining above the law and influencing public policy for their benefit.